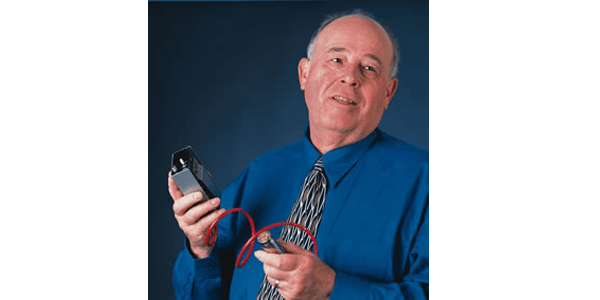 Donald W. Baker, former professor in UW Bioengineering and in Electrical Engineering, and inventor whose device has enabled life-saving imaging for millions of patients, passed away Feb. 27, 2018. By refining ultrasound into one of medicine’s most vital, cost-effective diagnostic tools available, Dr. Baker revolutionized the way medicine is performed around the world. In the late 1960s, Dr. Baker took early vague, fuzzy ultrasound images and discovered how to transform them into high-resolution, real-time images that reveal the inner structures of the body, from blood pumping through the heart to a fetus in the womb. His idea was to use pulsed Doppler technology, rather than continuous sound waves. Not only did the technique provide clear images, the method was completely non-invasive. In 2016, Dr. Baker was inducted as an inaugural member of the Washington Life Science Hall of Fame. The honor recognizes pioneers who have had the greatest impact on life sciences in Washington state. In a 2016 interview during his induction, he gave the following advice to young entrepreneurs: “You can’t predict what issues you may end up having to face, so the engineer needs to devote their life to constant learning.” Watch the 2016 Life Science Washington Hall of Fame interview with Dr. Baker. In 2002, the University of Washington and the UW Alumni Association awarded Dr. Baker their highest honor: the Alumnus Summa Laude Dignatus Award. He also has been honored with the Joseph Homes Pioneer Award of the American Institute of Ultrasound. His early inventions now reside in the permanent collections of the Smithsonian Institution’s National Museum of American History. Pioneering UW bioengineer Donald Baker, left. Dr. Baker was born in Skagway, Alaska, in 1932. From 1951-1955, he served in the United States Air Force in the Korean War. Dr. Baker graduated from UW’s electrical engineering program in 1960, and began work in the lab of the late pioneering UW bioengineering professor, Robert Rushmer, where he made his remarkable discovery. 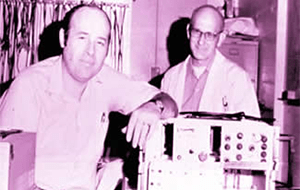 Dr. Baker published the landmark articles: “A phase coherent pulse Doppler system for cardiovascular measurement” in 1967 followed by “Pulsed Ultrasonic Blood Flow Sensing” in 1969. In the early 1970s, Dr. Baker and UW transferred his technology to industry by joining forces with a newly founded company called Advanced Technology Laboratories (ATL) in Bellevue, Wash. ATL became one of the world’s main suppliers of ultrasound equipment, and millions of people around the world benefitted from the new technology. Dr. Baker also developed a network of researchers and clinicians who would teach physicians about the new diagnostic tool locally and internationally. In 1980, Dr. Baker retired from the UW and went to work at ATL, now a part of Philips. The family requests that memorial contributions be sent to the University of Washington Don & Joan Baker Endowed Fellowship, which supports graduate students in Bioengineering or Electrical Engineering who are pursuing biomedical instrumentation. To donate, call 206-685-7748 or visit http://bit.ly/2HZ6kTO.